Communities in Schools Casino Night! Included in the ticket price is Heavy Hors d’oeuvres, one beer or wine ticket, one raffle prize ticket, and $20 in “funny money”. 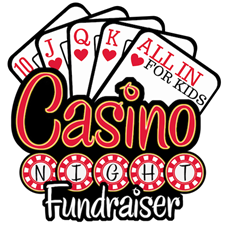 Communities In Schools of Federal Way is hosting it’s Third Annual All In For Kids Casino Night Fundraiser on April 20th at the Federal Way Community Center from 6:00 pm-10:00 pm, to benefit students in need. Guests will have the opportunity to try their luck at the “just for fun” blackjack, roulette, Let it Ride poker, and craps tables using “funny money.” There will also be a $10 entry Blackjack tournament. Throughout the evening players will earn raffle tickets by playing casino games, and at the end of the night, we will draw raffle tickets for prizes. Get dressed up, bring your friends, and come enjoy this fun 21+ event! Included in the ticket price is Heavy Hors d’oeuvres, one beer or wine ticket, one raffle prize ticket, and $20 in “funny money” to get your night of “Gambling for Good” started. Beer, wine, and a cocktails will be for sale.